Use of Irish photographs & Contact information. If you have an Irish themed website or require photos for a non-profit website or educational project, we can provide you with a maximum of 3 free - standard size images in exchange for a copyright notice, i.e, photo courtesy irelandposters.com & a link back to our site. 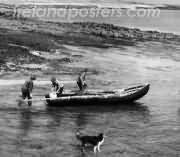 Where stated, original photographs of Ireland displayed on our site are copyright protected. Vintage Irish images, black & white prints. View site map for complete category listings.